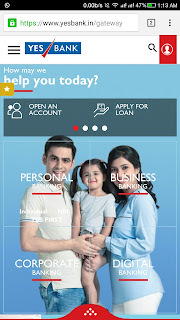 YES BANK launches their revamped ‘Mobile First’ website in India. When it comes to Banking services in India, There are 100's of services offered by various banks here, But the quality assurance is guaranteed only by the top notch banks. Yes Bank is considered as one of the best banks in India, Partly is the reason why we can witness that by their massive 1 Million following on Twitter. Their team is quite active resolving issues and helping customers with the best suitable suggestions. 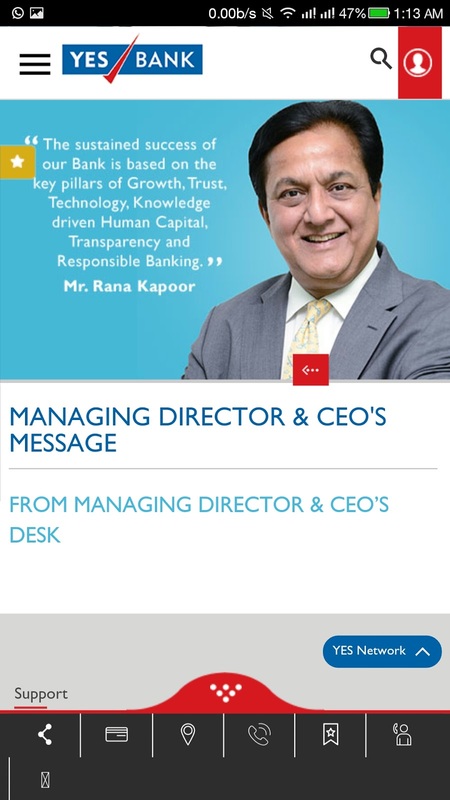 Yes Bank has retained its place in Banking sector among the top investors and customer relationships for a quite some time now. It is also known as the bank with the highest following on Twitter, which in turn plays a great role in boosting the Online services in India. They're also first in launching 2 step verification when it comes to digital banking in India. So stepping into that direction last week they launched a complete revamped version of their website which is cross platform compatible. Which means that the site now offers essential plugins which resize automatically upon the device you use to access the online banking services, which fits under the term "Responsive Websites." So today let's discuss the Yes Bank's upgraded mobile-first website. So the term Mobile First indicates today's world about how we are constantly shifting from larger screens to pocket-friendly devices. Partly because of the reason called "Mobility," we need everything at our fingertips to get our work done at the very next moment. So Yes Bank wants to leverage this power of mobility and convert their services so that it could be accessible to almost every smartphone user here in our country. India is reported to be in the Top 3 world's biggest smartphone users country. So Yes Bank has taken this opportunity to convert their existing website and offering lots of different services by just tweaking their User Interface. Now their website is compatible to run on all latest browsers, tablets, and mobile phones & you're suggested with the necessary tools upon the device you use, automatically. They are also the first Bank of India to launch their revamped site on a (.bank) domain. So to access their new website, head over to Yes.Bank, What a clever way to name it! You can also access their website at Yesbank.in; it'll automatically redirect you to their .bank domain. The new .bank domain is claimed to provide them an additional layer of security over the conventional domains that we usually witness every day. This dot bank extension domain serves as a great keyword for them, which will help them rank higher in search results and connecting that with their enormous following online, We're talking about some big things people. This could potentially help Yes Bank to have a massive reach in India regarding more customers, being on the forefront. The launch of this revamped website would work as a catalyst in establishing significant engagements in Online Banking, in turn, offering more security & a hassle free experience from customers end. Quick Note: Yes Bank is also the First Indian Bank to launch Facebook at Work. Unique tabs are featuring interactive buttons that would help you simply your banking choices such as Product Finder Tool, Fixed Deposit calculators, Product Comparator tool, etc. You will be suggested new products based upon your last visit by calculating the geography and visited time. It happens via the cached data, thereby resulting in personal product discovery. The search engine now has deeper search results and provides accurate information from the requested input. Various tools are present to serve as a platform perspective choice depending upon the device access for product application & services. There's always navigation tool present on the website so that the User won't get confused. Apart from Digital Banking, Recently they had also launched the "Star Star Service". It was primarily meant to provide a good customer experience, which connects a user directly to the bank over a call. Just dial (**2265) from any Smartphone keypad. These services are quite popular globally in countries like USA, Austrailia, etc. This service is created to work as a call to action function which triggers a universal call to Star Star Bank. It'll be interesting to see how such services perform and expand here in India. So to wrap it up, Yes Bank is tinkering with a lot in Digital Space here, and they're going to conquer it all soon, if everything falls in the right direction. The new responsive website and the .bank extension can indeed prove to be beneficial when it comes to today's online standards. Let's see how Yes Bank implements all of these changes on their newest customers and we can wait to test their services soon enough. Do let us know if you've any queries regarding this information so that we can get it resolved from the concerned officials. Make sure you share this news article with your friends and don't forget to leave a comment about your experience with Yes Bank.